Bed bugs are notoriously difficult to get rid of, but you shouldn't worry; with the right tools for the job and a little persistence, you can take back your life from these pests. Bed bugs are becoming increasingly widespread across the whole of the UK. 16% of all pest control callouts involve bed bugs, making them – by far – the second most common pest in the country, beaten only by rats. While bed bugs don’t carry diseases like many other pests and won’t physically harm you, that doesn’t mean they’re to be taken lightly. The bloodsucking insects are notoriously difficult to get rid of, with their itchy bites being found to disrupt sleep and cause anxiety and even depression according to the BMJ. Thankfully, you don’t always need to hire an expensive pest controller to get rid of bed bugs. With the right tools and a little persistence, you can wipe out these pests and take back control of your life once again. Bed bug infestations can be incredibly stressful, but they’re much easier to get rid of if you spot the signs early. That’s why it’s important to keep an eye out for these symptoms so you can nip a potential infestation in the bud as soon as possible. Bed bugs feed by biting you and sucking your blood. This means they commonly leave itchy red bite marks on your skin. These bites can appear on any part of your body, but you’ll usually find they’re grouped together in patterns or lines. This is usually the first sign people notice when they have an infestation. Be aware, however, that you can still have bed bugs even if you’re not covered in itchy bites. The red, itchy blotches that they leave are actually caused by an allergic reaction rather than the bites themselves. As some people are immune to this reaction, it’s entirely possible to be bitten by a bed bug and experience no symptoms whatsoever. Bear this in mind, especially if you share your bed with a partner – if one of you wakes up covered in itchy bites while the other one doesn’t, you shouldn’t rule out bed bugs as a potential cause. Bed bugs don’t necessarily live exclusively in beds, but, as our beds provide the perfect conditions for them to thrive, the chances are that it’s the first place you’ll find them. They make your bedsheets feel as if they’re full of sand or bits of dirt. This is as a result of the bed bug eggs, shed skins, and droppings that will gradually build up inside your bed. If you notice an uncomfortable gritty feeling in your bedsheets, grab a torch and closely inspect your bedsheets, bed frame, and headboard. Check for shells, dead bugs, and sand-like reddish-brown droppings by running your hand across the bed – you might also find the bugs themselves while you’re looking! As bed bugs like to live so close to us, we can sometimes squash them in our sleep. If the squashed bug has fed recently, it’ll leave a bloody spot on your bed. This will only be a very tiny pin-prick of blood, so it’s nothing to worry about, but it will be noticeable on white sheets. Bed bugs are notoriously difficult to get rid of. They’re incredibly tough creatures that can survive almost anywhere in a pinch and have quickly evolved to be resistant to many pest control measures. Not only are their tiny, flat bodies able to squeeze into cracks to escape insecticide treatments, but they’ve adapted to our use of pesticides and are now much more resistant to treatments than they were a few decades ago. What this means is that it’s more difficult to get rid of a bed bug infestation nowadays as the new breed of pests can take more insecticide before they die – but this is not to say that it’s impossible to get rid of them. You simply need to use top-quality bed bug killers while also being persistent enough to re-treat the area several times. 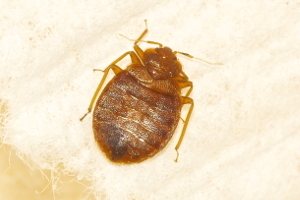 You should never rely on a single treatment to wipe out a bed bug infestation. All it takes is a single surviving bed bug to lay eggs, and you’ll be back to a fully-fledged infestation within months, so you need to make sure that you treat and re-treat your home with several different products to get the job done. For example, if you use our Protector C powder, you should also use a smoke bomb and a Biopren spray at the same time. The powder will mop up any bed bugs that the smoke bomb missed, while the Biopren spray will prevent any surviving bed bugs from reproducing. Two thorough treatments like this will ensure you finally get rid of the creatures for good. You should also ensure you wash and dry all of your clothes and bedding on a hot cycle – as hot as the fabric can withstand. Washing at 40°C can kill adult bugs, but the eggs can survive these temperatures. If you wash at 60°C, this will wipe out both the bugs and their eggs. There are many different ways to get rid of bed bugs, so it can be difficult to know where to start. We’ll break down the options available here so you know what to look out for. Smoke bombs – also known as fumers or foggers – emit a powerful insecticidal smoke that disperses into every corner of your room. These are popular as the smoke can reach areas that other products might miss. Usually, they contain an insecticide called permethrin which attacks the brain of the insects, killing them outright or causing them to wander out of their hiding spots and opening them up to more methods of attack. Simple and effective, insecticidal sprays cover any surface in a room with a strong insecticide. Some sprays have a long-lasting effect that protects against bed bugs for weeks after application, meaning you’re protected against infestations re-emerging. They’re very effective when combined with a fumer as the smoke will drive the bugs out of their hiding places and onto the spray-covered surfaces. Powders have a similar effect to sprays, but are better for use on porous surfaces where sprays might soak in and cause discolouration. They can also be used around plug sockets or other places where spraying a liquid isn’t a good idea. As with sprays, they’re effective when combined with a smoke bomb. Bed bugs are tough creatures, and even the most effective pest control products might miss a couple here and there. However, if you can stop the bug from reproducing, that won’t matter – they won’t lay any more eggs and will simply die off. Biopren does just that – it kills most bed bugs and stops any survivors from advancing to the next stage of their life cycle so they can never reproduce. As a result, it’s simply essential when trying to get rid of an infestation! When looking for signs of an infestation, it’s helpful to know what it is you’re looking for! Bed bugs are tiny, bloodsucking parasites that have been feeding on humans for thousands of years. They’re small – growing to about 5mm long – and have flat brown bodies which are useful for squeezing into cracks and crevices. If you do find bed bugs in your bed, you might find that some of them look slightly different. This is because they have several different stages to their life cycle. They start off as eggs, which look like tiny grains of rice. Once hatched, bed bug nymphs must feed within 10 days to shed their skin and move on to the next stage of their life cycle. They go through five of these stages before adulthood, but they all look very similar – they’re small and flat like adult bed bugs, but they have clear, yellowish bodies as opposed to the brown body of an adult. The only real difference between them is their size. When dealing with a problem as serious as bed bugs, it helps to know the fact from the fiction. We’ll clear up a few common myths so you know exactly what you’re dealing with! Do Bed Bugs Only Live in Beds? While beds are the ideal breeding ground for any bed bug, they can also be found in carpets, clothing, sofas, seating (even public transport seating! ), wardrobes, and anywhere else around the home. Do Bed Bugs Feed on Other Animals? In a pinch, yes. While they prefer to feed on humans as they don’t like crawling through animal fur, they can still survive on animal blood and can be brought into the home by your pets. Are Bed Bugs Attracted to Dirt? No! One of the biggest myths surrounding bed bugs is that if you get them, it’s because you’re somehow unhygienic or dirty. This is simply not the case – bed bugs aren’t picky and are just as likely to find a home in a five-star hotel or expensive apartment as they are anywhere else. Can Bed Bugs Infest Bus and Train Seats? Yes – in fact, bus and train seats are perfect for them. They have a constant supply of food getting on and off all day, they have a lot of nooks and crannies to hide in, and they’re kept at an even temperature! Before sitting down, you should run your hand over the surface of a seat when using public transport. This is even more important in built-up areas where bed bugs are more common, such as London or Birmingham. Can You Only Catch Bed Bugs in Summer? Bed bug infestations spread more slowly in winter as cold weather prolongs their life cycle (it sounds backwards, but this means they lay eggs more slowly). However, you can still catch them during the cold seasons! While they’re certainly more common in summer, you should be on your guard against them all year round.